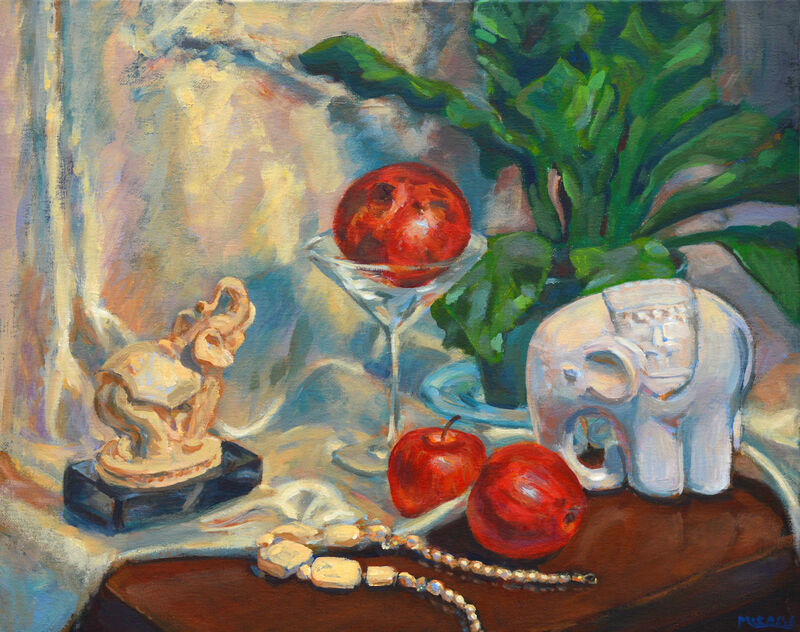 Lucky Red #6 – White Elephants, acrylic on canvas, 16 x 20, Kit Miracle. This is another painting in the series which depicts many symbols of good luck. 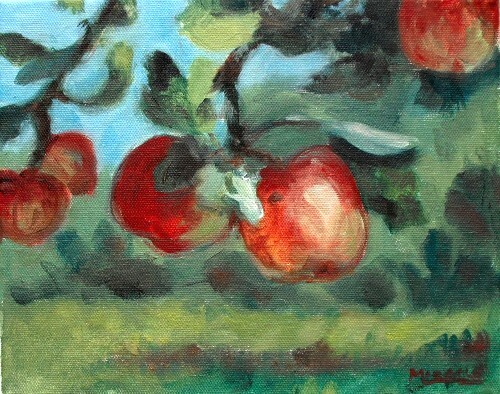 This is the sixth painting in my Lucky Red series. There are more symbols of power and good fortune in this set up. 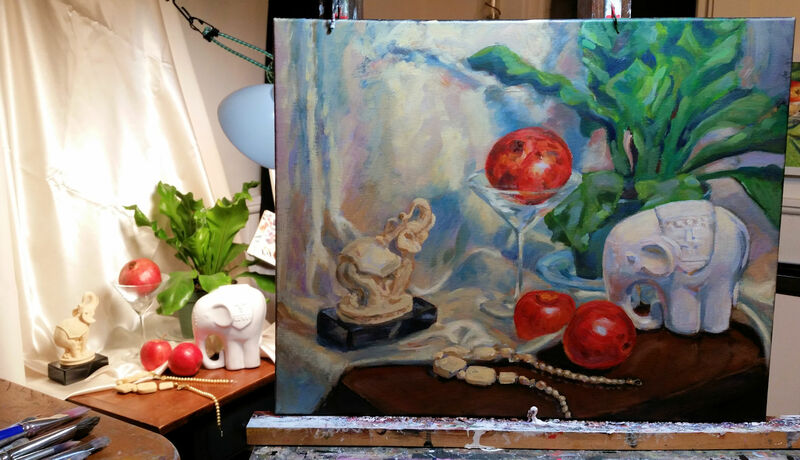 The still life arrangement plays off the many shades of whites and reds with a little green for eye relief. I love the way it glows. Lucky Red #6- detail 1. Here you can see the various treatments of white. White alabaster elephant, white satin background, white bone and pearl necklace. I also love the red pomegranate and apples for contrast. Both of these white elephants are relatively new acquisitions. The alabaster elephant on the left has a creamy glow and its upraised trunk portends attracting good fortune. The white elephant on the right has a lowered trunk which symbolizes leaving good fortune. Elephants also symbolize strength and power (not a surprise) in addition to honor and stability. These all seem good qualities to me. Lucky Red #6 – detail 2. 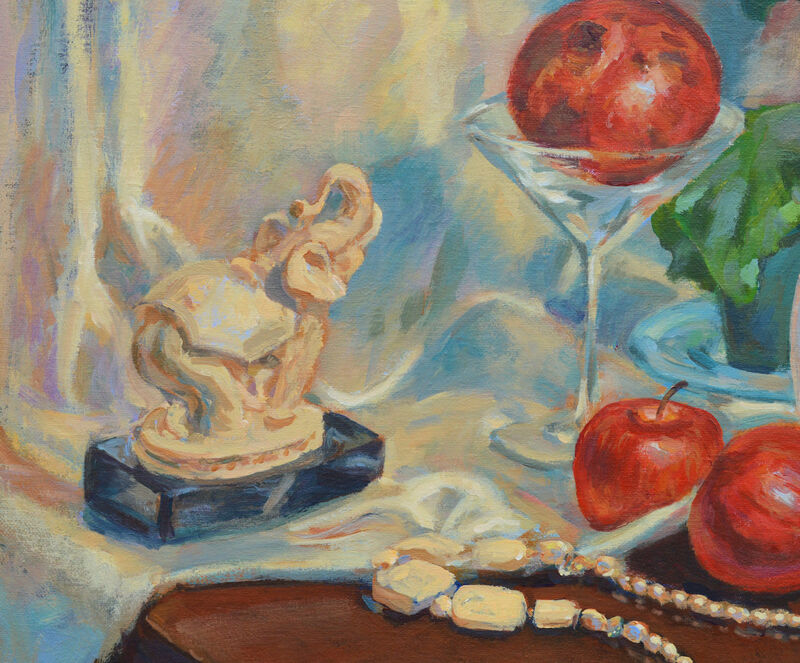 More close-ups of the second elephant, pearls, and apples. Again I have placed a pomegranate in the painting. 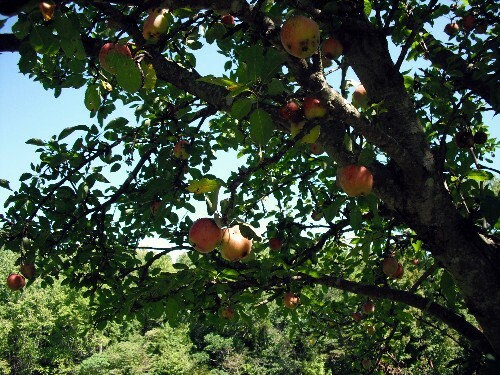 This symbolizes fertility as do the apples in addition to knowledge. The martini glass is just for fun. Of course. The pearls in the necklace also connote many positive meanings: sincerity, purity, good luck, wealth, integrity among others. Plus, they were fun to paint. Lucky Red #6 – White Elephants. This is the set up as I had it in my studio. There’s a lot of eye/hand coordination when painting a still life, or anything from life actually. Mostly, it’s a matter of practice, practice, practice. I can’t vouch for the veracity of the good fortune that any of these items will bring, but I love to create still lifes that are a little beyond just pretty pictures. 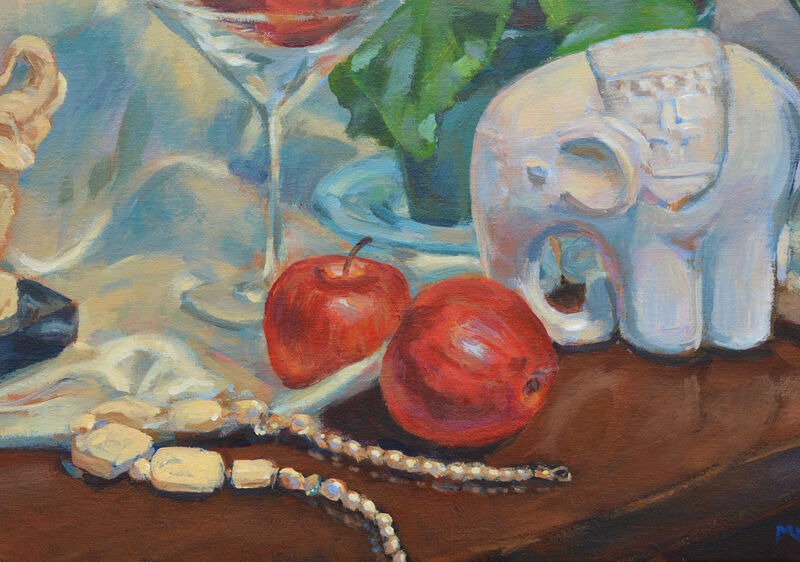 This series of Lucky Red still lifes features good luck symbols and the color red at least somewhere in each painting. 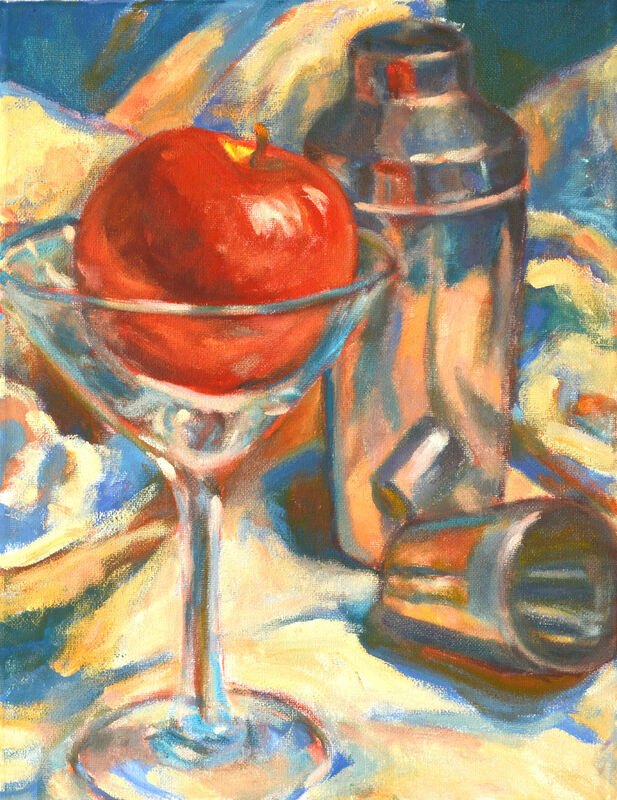 This painting was a fun challenge to paint with so many shades of white and red, reflections and shadows. I’m often asked how I can find the time to paint, especially with a full-time job. My answer is that if it’s really important to you, you’ll make the time. In my case, summers are my less busy time but in the performing arts season, my weekends are usually busy. One of the good things about living on my 90 acres is that I can just walk out the door of my studio and find something paintable, nearly every season, any time of day. Sometimes I don’t have a great deal of time to pack up and drive to some scenic location so I start scouting around the farm for something interesting.